Rekha Pitchumani, a computer science graduate student in the Baskin School of Engineering at UC Santa Cruz, has been developing new data storage technologies in collaboration with Seagate, a leader in the storage industry. 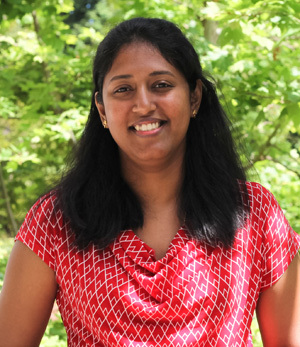 Pitchumani's work on storage technologies at UCSC's Storage Systems Research Center (SSRC) came to the attention of Seagate representatives at the SSRC's annual research retreat in 2013. She will be presenting her latest results at this year's retreat, which takes place on Wednesday, May 21, at the Baskin School of Engineering. In the rapidly evolving field of data storage, the SSRC has been a leading academic research center for more than a decade. 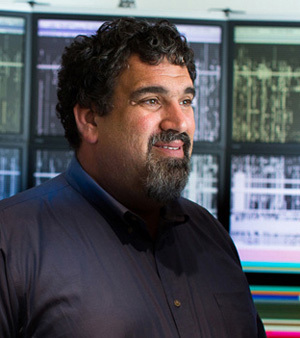 Strong relationships with top companies in the storage industry help ensure that SSRC researchers and graduate students are focusing their efforts on important problems and preparing for the challenges of the future, said Ethan Miller, professor of computer science and Pitchumani's adviser. "When companies need to solve a problem to continue developing a product, we hope our research has created a foundation for an application," Miller said. Pitchumani has been working on shingled disk technology. Shingled disks were developed to enable computer disk drives to store more information by overlapping the data tracks like roof shingles. To write data on a shingled disk, however, a computer needs new software, and updating large server farms with shingled disks requires a labor-intensive software upgrade for each server. Pitchumani wanted to simplify that process by developing data management software that could be placed directly on a shingled disk. "Intelligent" disks could then manage themselves, eliminating the software installation step in upgrading server storage. After hearing Pitchumani's presentation last year, Seagate offered her an internship for the summer, during which she developed software for a shingled disk storage system. Pitchumani is working directly with several of Seagate's senior technologists to incorporate her work into a new storage platform the company launched in mid-2013. "Rekha has the perfect combination of a great organization in SSRC and a Ph.D. thesis that was a match for what the industry is struggling with," said James Hughes, principal technologist at Seagate. "Her ability to work all the way from abstract idea to the actual code makes what she does immediately relevant." Seagate was ready to hire her after the internship, but Pitchumani said they understood that finishing her Ph.D. research is her first priority. Because of the university's close proximity to Seagate's offices in Cupertino, Pitchumani has continued a part-time internship with the company while working on her academic research. She said she's happy her research is already having an impact in society. "Usually, Ph.D. students are not able to get their research into real products during graduate school," Pitchumani said. Since 2013, the SSRC has maintained its connections with companies in the data storage industry through the Center for Research in Storage Systems (CRSS), established at UCSC through the National Science Foundation's Industry/University Cooperative Research Program. CRSS receives more than $500,000 of support from industry each year. Company sponsors do not dictate what projects the UCSC researchers tackle, but they provide valuable input by identifying important challenges facing the industry. Maintaining relationships with industry has been part of the SSRC philosophy since the group was founded more than a decade ago, said Darrell Long, professor of computer science and SSRC director. Many graduate alumni from the group now work at technology companies, while others have positions at universities and national laboratories. It's common for students in the data storage research group to have several job offers before they graduate, Long said. Research conducted at SSRC often produces ideas and strategies that are later incorporated into commercial products. In the mid-1990s, for example, SSRC pioneered the use of "deduplication" to consolidate storage by taking advantage of redundancies in the data. Several companies took the ideas from that research and worked to improve the stability of the algorithms. About a decade later, products based on that original approach were on the market. In the mid-2000s, SSRC researchers developed new ways to archive data for long-term storage. Some start-up companies are building storage systems using the architecture developed at UCSC, and people who worked on the project as graduate students now work for those companies, Miller said. Lawrence You, now director of privacy at Google, was among the graduate students who worked on deduplication and archival storage projects, earning his Ph.D. in 2006. He worked with Long to develop a highly efficient archival storage system, called Deep Store. "Storing archival data over a long period of time is still a hard problem today because data volumes continue to grow, demands for online storage and cloud services are increasing, and data formats continue to evolve," You said. "Moreover, expectations of reliability, availability, and the need to ensure that data is protected now and deletable later further challenge us to develop new types of storage systems to satisfy those needs." SSRC researchers try to anticipate problems that the storage industry might encounter within the next five years or so. The need for energy efficient storage, for example, is a growing concern, Miller said. The use of alternative materials in storage media will also create new challenges. At SSRC, researchers are already working to find solutions.